Shovel Knight is the game that keeps on giving. Released in 2014, it’s since had two DLC expansions and now the third one is on its way. These aren’t small expansions either. Each one is a story that is as lengthy as the main game, and has totally different gameplay and level design. I wasn’t too hot on the first expansion, Plague of Shadows. It just felt like a remixed version of the main campaign and didn’t have much unique level design. Specter of Torment, however, was a huge jump in quality, and in some ways I think is even better than the main game. Fantastic gameplay and level design that was totally different. The latest one, King of Cards, seems to definitely follow suit. In King of Cards, your main ability is a shoulder charge that propels King Knight forward and does damage. This is the main way you’ll attack enemies, and it’s also used to jump over gaps. 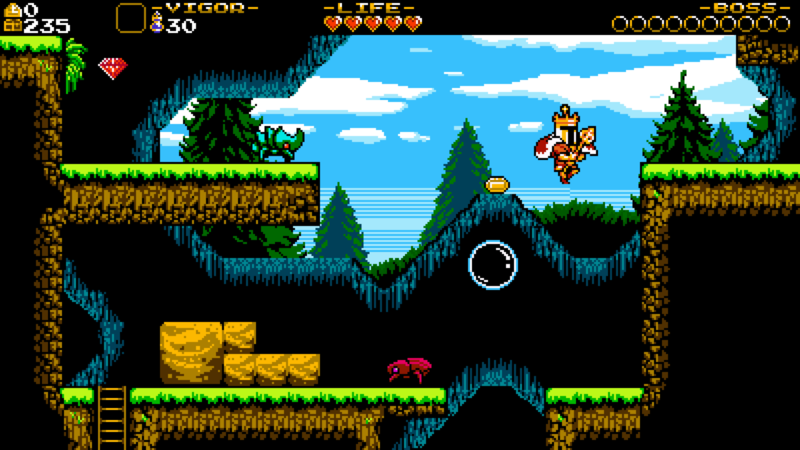 Upon hitting an enemy or a wall, King Knight will bounce up and start spinning around. In this state, you can continuously bounce off enemies or destroy blocks beneath you. After bouncing off an enemy or block, you can do another shoulder charge. When you get really good at it, you can go through some rooms without even hitting the ground. The demo contained three parts. An easy segment, a hard segment, and the card mini-game. The easy segment was just the tutorial level. It acquaints you with how to use the shoulder charge. There was also a new enemy type that had to first be shoulder charged, and then bounced off of in order to kill it. The boss of the easy segment was Specter Knight, only he uses the abilities he had in the Specter of Torment campaign rather than the main campaign. 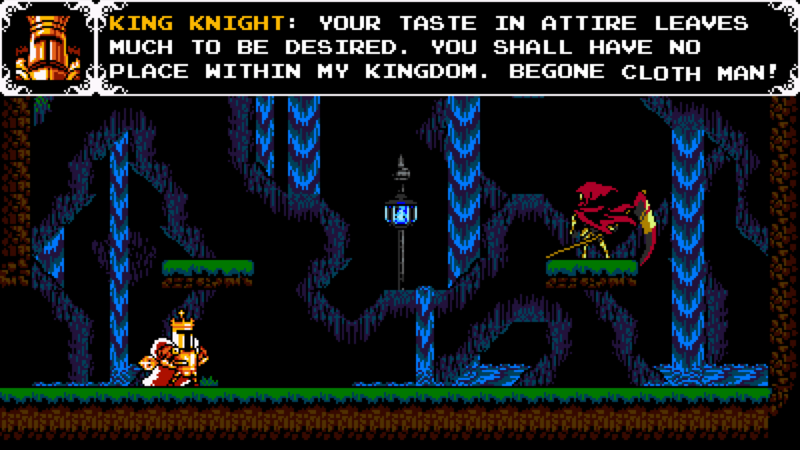 I found the AI of Specter Knight to be a little weird. Sometimes he would just stand around and do nothing, waiting for the player to act. Not sure if this is intentional or if it’s still a work in progress. 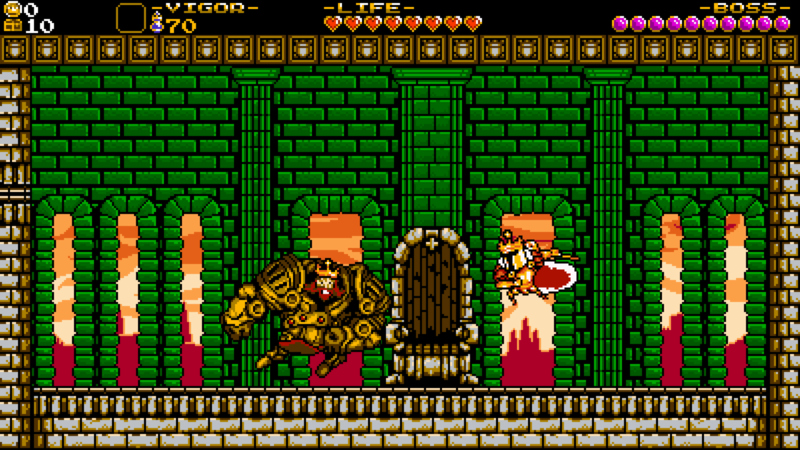 The hard segment was from a later level, King Knight’s level, in fact. There were a few new enemy types in this area. One was a cluster of flying rats, where you had to continuously bounce off of it to shake off the rats and kill it. Another was a mage that shot out projectiles that you can shoulder charge off of it, which you had to utilize to get around some obstacles. My personal favorite was a giant buff knight that could repel your shoulder charges. You either needed to find some way to bounce on top of him, or push him off a ledge. The boss of that area was a brand new boss, a king in a giant suit of armor. For this one, you had to shoulder charge into him and then bounce off of his head. He also throws projectiles at you, so you can’t just keep bouncing on him. I found this boss to be quite a bit easier. Safe to say this will be in the full game, considering it’s brand new and in the promotional material. Finally is the card game, which is absolutely brilliant. It’s simple to learn, requires just the right amount of strategy, and matches last maybe 30 seconds. It’s the perfect thing for a neat diversionary little mini-game. It reminds me a lot of Triple Triad from Final Fantasy VIII in this way. The rules are simple. There’s a playing field, which in this demo was either 2 x 2 squares or 3 x 3. There are gems on the field, and the goal is to get at least the majority of them by having your card on top of them. 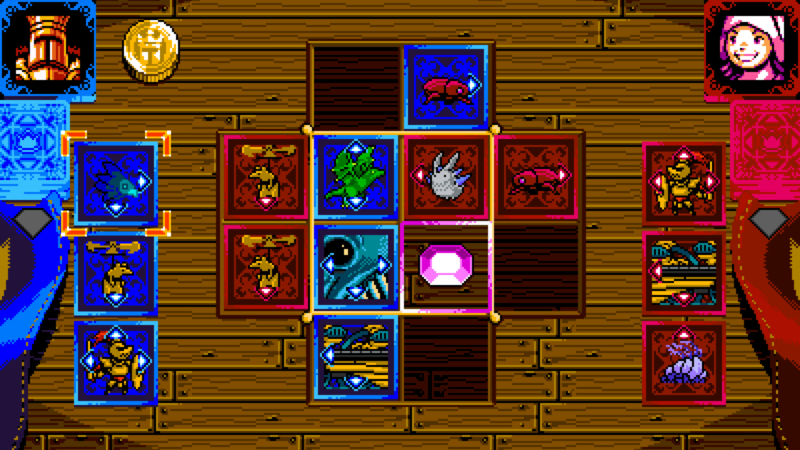 The game ends when all the squares in the field are occupied. In order to win, you have to strategically “push” your opponents cards in such a way that they can’t get the gems. Each card has arrows on them and they dictate which direction they can push cards. On the flip side, their arrows also dictate how they can be pushed. For example, if your card has an arrow going to the right, your opponent can’t push the card from that direction. It’s a bit hard to explain in writing like this, but trust me, it only takes a minute to come to grips with it. As much as I loved the new gameplay for King of Cards, the card game is what really left an impression on me. I can’t say I expected Shovel Knight to get a card game, and it’s surprisingly fun. I’m really hoping this plays a big role in the campaign. I’m definitely looking forward to this game. If the quality of the level design is on par with everything else in Shovel Knight, then the King of Cards expansion will yet again be one of the best platformers I’ve played.